One pastor's story of a faith that cost him everything in India, and a Savior that is faithful to the point of death. The Church in India is growing at an unprecedented rate, with village church pastors forging a burgeoning movement. In January 2015, more than 1 million people converted to Christianity at a single-tent revival event. Increasingly, the leaders of these churches are bearing the brunt of persecution in India, often finding themselves the first target of Hindu extremists, especially when extremists begin to see the impact of these leaders and their passion to share the gospel. “Will you leave your Christian faith or not?” shouted a Naxalite, one of India’s communist insurgents. Tilak’s reply was slow but strong. As soon as he had completed his sentence, his attackers hurriedly tied his hands behind his back and bound his legs together. Grabbing a thick stick, they began to beat him, ordering him to climb the mountain. Amidst the blows, Tilak continued the slow ascent on his hands and knees, dragging himself through thorns and jagged rocks. His body was bloody and mangled, the pain surreal. A vivid picture of his Lord on the way to Calvary kept him sane as he crawled on through the night, blow by blow, inch by inch. With each passing moment, he felt himself growing weaker, the struggle to move becoming more intense. He could feel the hatred of these men, and to think–it was all because his ministry had seen 40 families turn to Christ. As a believer, opposition towards Christ had become opposition towards him. His time had come. When he could bear it no longer, Tilak collapsed, motionless. The Naxalites checked his pulse. Nothing. They called a village doctor just to be sure. Reassured that they had done their job, the men threw Tilak’s body into a ditch without mercy, returning to the village with their heads held high. Multiple Christian families rushed out into the night, scouring the forest for any sign of their beloved pastor. When they finally found his lifeless body in a ditch, just as his persecutors had said, they began the trek back home in tears. They carried him–his weight in their arms. As local Christians made their way towards Tilak’s hut, they struggled to believe that he was dead. When they arrived and saw his body and the mourning crowd gathered around it, the reality of their pastor’s murder began to set in. But as they mourned, something unfathomable happened. Slowly at first, Tilak’s body began to move. They were sure their emotions and the dim light were playing tricks on them. It was impossible. As Tilak’s eyes began to gradually open, they were overcome with awe. When his persecutors heard the news, they rushed to the house to see it for themselves. Hindu villagers, the same ones who had urged the Naxalites to silence this man, were shocked. They were the ones who had complained that he was polluting the minds of their neighbors with his gospel, confident that the Naxalites would make quick work of him. They had been so sure he was finished once he was kidnapped, knowing that a Naxalite trial was a mere formality rather than a true hearing. With the communists as jury, judge and prosecution, how could he have stood a chance? The Naxalites, including those who had murdered Tilak with their own hands, looked on in disbelief. Who was this Jesus, that He held the power of life and death in His hands? And what would become of them, persecutors of this man who served Him? Despite his brush with death, Tilak would not be silenced. He carried on his ministry as before, again prompting the Hindu villagers to complain. This time the Naxalites were afraid to torture him, remembering that he served a powerful God. They took him to the forest secretly and told him to flee, threatening to kill his entire family if he spared even a moment. “I left the village with my family at once, as I had suffered extreme torture a year ago. I didn’t want the same for my family,” Tilak shares with an Open Doors ministry partner. He looks away as if trying to forget the painful memory. In the new village, Tilak saw God’s provision once again. As he shared his struggles with those he met, one person offered to help him. The man took Tilak’s family into his hut and asked them to stay. 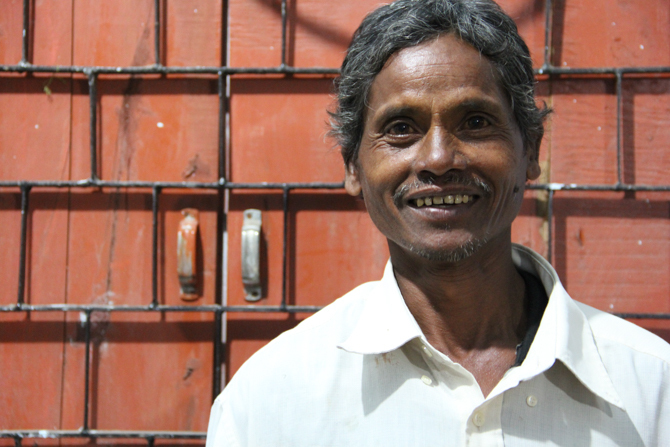 “This person who helped me had seen me when I used to minister in and around my village,” says Tilak. “He had heard my preaching before and had developed faith in his heart. He immediately recognized me when I visited his village that day. He worked as a mason. He was a very poor man with a big heart.” Tilak smiles as he remembers. Today, after more than a year, Tilak and his family live in that same hut. The two families help each other by pooling their resources. Not long ago, some Open Doors partners paid them a visit to provide much-needed groceries and other daily necessities. They also invited Tilak to a Persecution Preparedness Seminar. Though Tilak and his family are not able to continue their ministry and are still struggling to make ends meet, they hold fast to Christ, knowing He sustains them. Tilak and his family as they continue to heal. Tilak hopes to enter into ministry once again.